Victoria was the second State of Australia to achieve Arms, following the creation of the Commonwealth in 1901. The State Badge of Victoria and the Victorian Coat of Arms can only be used with permission and in certain circumstances. A blue shield with five silver stars arranged to represent the Southern Cross. A kangaroo holding a gold Imperial Crown with silver and blue ribbons at its base. Silver and blue are the official colours of the State. On either side of the shield are two female figures. The figure on the left represents peace. She wears a laurel wreath crown carries a sprig of olive in her hand. The figure on the right represents prosperity. She wears a crown of golden cereal, and holds a Cornucopia, symbolic of abundance. 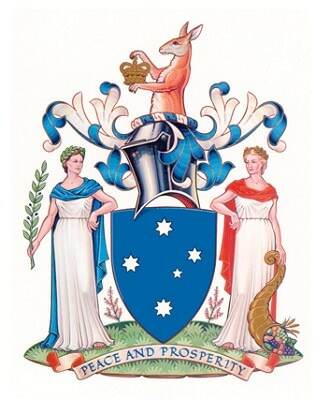 The motto Peace and Prosperity was the first to be in English among the Arms of Public Authority in Australia. There were no changes for the next half century. In 1958 the Pink Heath (Epacris impressa Labill.) was proclaimed as the floral emblem of Victoria. This in turn led to a desire that it be included somewhere in the Armorial Ensigns of the State. To this end, correspondence was entered into with Garter King of Arms. The obvious solution was to have the plant shown growing from a grassy mound. This mound, called a Compartment in heraldry, would also provide a firm base for the two Supporters. On the 28 March 1973 Queen Elizabeth II signed a further Royal Warrant which added the mound. While the rest of the Armorial Bearings remained essentially the same as in the 1910 Royal Warrant, the opportunity was taken to reinterpret some of the elements. For example, the Crest Kangaroo now holds a St. Edward's Crown.